For some reason the idea of roasting chestnuts scares me. I’m not afraid that they’ll explode from the heat. Rather, its that post-oven they’ll go whizzing around the kitchen in some snake-like airborne state, hissing and weaving and emitting odd steam. This fear of roasting chestnuts may date from a childhood visit to New York where there were vendors selling roasted chestnuts and hot dogs outside the MoMA. For some reason I confused the logic behind the construction of their wheeled metal sales contraptions: large and solid to avoid damage and the elements and shiny to attract patrons. But I took the solidity as a barricade between humans and the dangerous materials heating within and thought the wheels might serve as a means of expedient removal in times of extra threat. Like a chestnut powered tank or perhaps a mobile anthrax culture lab . . . Eating chestnuts is another thing and I’m particularly fond of chestnut jam (Through the Eyes of French Design has some wonderful images of prepared chestnuts, including Confiture de Marrons. Many chestnut jams/spreads are from the Ardèche region of France). Chestnut flour is gluten-free and may be used to make desserts and even pasta. The first time I went to Coppa in Boston they had a delicious sounding chestnut pasta dish on the menu but I’ve unfortunately not yet tried it. I’m not sure if its always the same one; the current menu lists Fettuccine di Brambly (House made chestnut pasta with heritage pork and roasted chestnuts). Yum. Coppa bills itself as an enoteca: an Italian term essentially meaning “wine bar” or “wine cellar”. Italy is a major producer of chestnuts, exporting them to France and the US among other destinations. Not surprisingly “European (sweet) chestnuts” are grown in Europe whereas a number of “American chestnut” species once grew in the US and Canada until they were almost eradicated by the chestnut blight of the early 20th century. You can however, buy domestically grown chestnuts in the US. One source is Allen Creek Farm, in Washington State who sell a variety of chestnut products. Their site has a page of Tuscan chestnut recipes, including the amazing sounding Crema con Fave e Cardi (Broad Beans and Cardoom Thistle Cream) which uses chestnut flour. They will not ship chestnuts outside the US due to the fact that unlike other nuts chestnuts must be kept chilled and spoil easily. Culinarily and evolutionarily this seems a mis-step on Nature’s part and I assume the squirrels are up in arms (about the rotting, not the shipping). I never refrigerated the chestnuts I bought a month ago so I assume something disgraceful has happened internally. All of this leads back to the other day’s entry on beer. 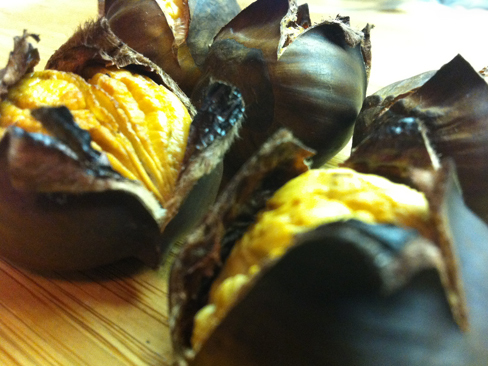 Peeled roasted chestnuts are an optional flavoring. I bought new chestnuts and roasted them. Quite a mundane experience, except that the instructions with the beer state the wrong roasting temperature (far too cool). No explosions, snakes, or strange steam. If you acquire some chestnuts and then think better about roasting them you can watch this video for alternate suggestions. Its very cute but keep the volume turned down. . .